Robin Youngs, Edward Fisher,	The Journal of Laryngology & Otology, Volume 127 Issue 9, p 841. F Celenk, T Baglam, E Baysal, C Durucu, Z A Karatas, S Mumbuc, M Kanlikama,	The Journal of Laryngology & Otology, Volume 127 Issue 9, pp 842-847. S Isaradisaikul, N Navacharoen, C Hanprasertpong, J Kangsanarak,	The Journal of Laryngology & Otology, Volume 127 Issue 9, pp 848-853. W-K Low, C A Tham, V-D D'Souza, S-W Teng,	The Journal of Laryngology & Otology, Volume 127 Issue 9, pp 854-858. M Sayles, H A Kamel, F F Fahmy,	The Journal of Laryngology & Otology, Volume 127 Issue 9, pp 859-866. N Uri, O Ronen, T Marshak, O Parpara, M Nashashibi, M Gruber,	The Journal of Laryngology & Otology, Volume 127 Issue 9, pp 867-871. Indolent mucormycosis of the paranasal sinus in immunocompetent patients: are antifungal drugs needed? H Jung, S K Park,	The Journal of Laryngology & Otology, Volume 127 Issue 9, pp 872-875. B Indirani, R Raman, S Z Omar,	The Journal of Laryngology & Otology, Volume 127 Issue 9, pp 876-881. X-G Ni, R-R Cheng, S-Q Lai, L Zhang, S He, Y-M Zhang, G-Q Wang,	The Journal of Laryngology & Otology, Volume 127 Issue 9, pp 882-889. F M Makki, A Hilal, E Fung, R Hart, S M Taylor, T Brown,	The Journal of Laryngology & Otology, Volume 127 Issue 9, pp 890-896. Y-H Tan, G-N Du, Y-G Xiao, S-Q Guo, T Wu, P-Z Chen, G-B Yan, D-X Tan, K Wang,	The Journal of Laryngology & Otology, Volume 127 Issue 9, pp 897-901. O Malard, R Wagner, M Joubert, A-S Delemazure, E Rio, N Durand, F Espitalier,	The Journal of Laryngology & Otology, Volume 127 Issue 9, pp 902-907. V Balakrishnan, S Berry, B Stew, A Sizeland,	The Journal of Laryngology & Otology, Volume 127 Issue 9, pp 908-916. J Manickavasagam, K Wu, N D Bateman,	The Journal of Laryngology & Otology, Volume 127 Issue 9, pp 917-921. A C Leong, D A Bowdler,	The Journal of Laryngology & Otology, Volume 127 Issue 9, pp 922-923. 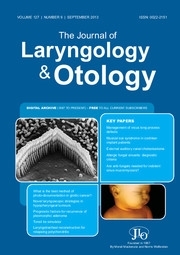 J Duodu, T H J Lesser,	The Journal of Laryngology & Otology, Volume 127 Issue 9, pp 924-926. J Manickavasagam, A Jebreel,	The Journal of Laryngology & Otology, Volume 127 Issue 9, pp 927-929. M I Syed, P W Jenkinson, S Denholm,	The Journal of Laryngology & Otology, Volume 127 Issue 9, pp 930-931. C Xie, N Shah, P L Shah, G Sandhu,	The Journal of Laryngology & Otology, Volume 127 Issue 9, pp 932-935. J H Jung, S M Hyun, H J Park, T H Yoon,	The Journal of Laryngology & Otology, Volume 127 Issue 9, pp 936-938. L M Lim, K B Tan, F Petersson, M Thong,	The Journal of Laryngology & Otology, Volume 127 Issue 9, pp 939-941. H Matsuyama, K Yamazaki, M Tomita, S Takahashi,	The Journal of Laryngology & Otology, Volume 127 Issue 9, pp 942-946. Long-term ventilation tubes: for how long should they be used? V Rinaldi, A Messaoudi, L M Gaini, M Gaffuri, G Fabio, L Pignataro,	The Journal of Laryngology & Otology, Volume 127 Issue 9, pp 947-948. H Mohammed,	The Journal of Laryngology & Otology, Volume 127 Issue 9, pp 948-949.